Since today all Git repositories from Hosted Weblate are exported over https. The previous git URLs will continue to work for some time. The exact depreciation schedule is not yet decided as this URL might be included in various scripts and there is nothing pushing us to disable the service. 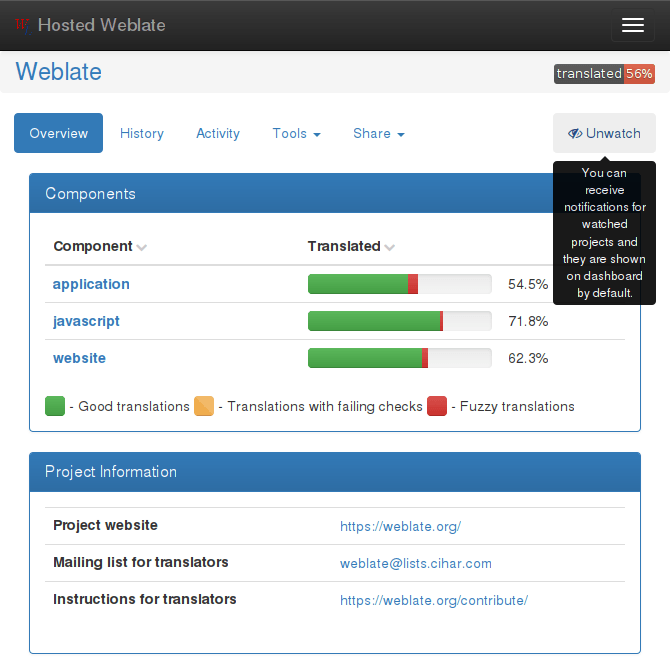 The new Git URLs are consistent with Weblate URLs, just with /git/ in the path, so for example when your project is https://hosted.weblate.org/projects/weblate/website/, you can clone it using git clone https://hosted.weblate.org/git/weblate/website/. Another important change is for private repositories, this now requires authentication using API key. You can specify it on the clone URL (git clone https://user:key@hosted.weblate.org/git/weblate/website/) or use gitcredentials to store it separately. The API key can be obtained from your user profile API page (once you're authenticated to Weblate). Published on Nov. 18, 2016, 2 p.m.